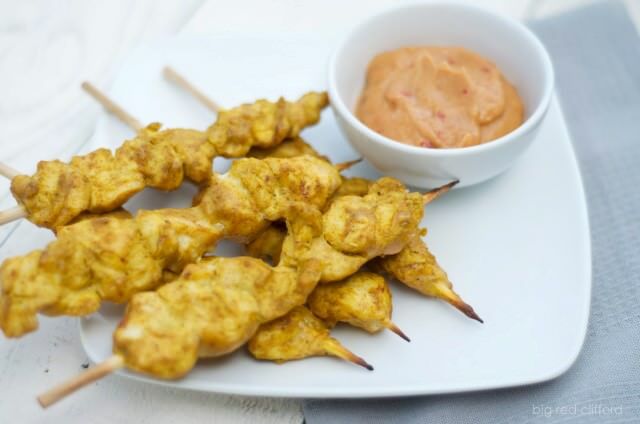 For the chicken marinade, add the ½ cup of coconut milk, curry powder, turmeric, 1 teaspoon of sugar and salt in a bowl. Toss in the diced chicken ensuring each piece is evenly coated. Set aside. To make the peanut sauce, heat the remaining ¾ cup of coconut milk in a small saucepan. Add the red chilli sauce and simmer for about 5 minutes. Add the peanut butter, 2 tablespoons of sugar, vinegar and fish sauce. Continue to simmer the mixture to thicken to your desired consistency. Heat and oil a grill or fry pan and cook off the chicken skewers until just cooked. Serve with the peanut sauce and your choice of sides.